Billy Monger winning a prize at Sports Personality of the Year, paratriathlete Lauren Steadman in the semi-final of Strictly and Anne Hegerty in I'm a Celebrity. 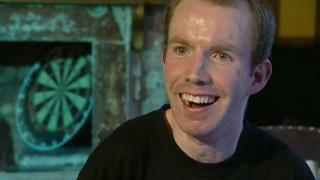 They all happened in 2018 and are all reasons why Lee Ridley - better known as Lost Voice Guy from Britain's Got Talent - says it's been "a big year for disability". "The talents, ambitions and potential of disabled people are starting to be recognised like never before," Lee says. These are the people and the moments (and one piece of tech) which he calls his "disability gamechangers" of the year. OK so Lee's picked himself as one of the year's top moments, but on balance it's probably fair enough. He's the first comedian to win Britain's Got Talent. In the final he joked about the show's founder Simon Cowell. Lee said he'd had a facelift - and it was "almost as bad as Simon's." He was in the final with Robert White, another comedian, who has Asperger's syndrome. "To have two disabled comedians in this final was an incredible moment not just for me but for all disabled people," says Lee. She says people's perceptions of her disability have changed since appearing on television since she was on Strictly. "Before, kids and adults would look at me and see my arm first before they saw me," she said. Anne Hegerty has been praised for opening up about her Asperger's on I'm A Celebrity Get Me Out of Here. In this year's series she spoke to former EastEnders actress Rita Simons about her condition. "I didn't raise the autism issue. It's not like: 'I want you to know I have this interesting disability that you have to accommodate'," Anne explained. Lee says: "Anne's conversations in camp about autism really touched a chord with the British public, helping to positively change attitudes towards autism and Asperger's syndrome." Now, he's back racing - this time in F3. Billy told Radio 1 Newsbeat in October why it's important for him to race against able-bodied drivers. Lee says: "Brilliant Billy Whizz returned to racing this year and went on to win the Helen Rollason Award at the 2018 BBC Sports Personality of the Year." Newsbeat reporter Rob Adcock was at the awards when Billy walked up on stage to claim his prize: "It was an emotionally charged atmosphere when Billy was on stage. People in the audience stood up and applauded him." "Hats off to Microsoft for making their Xbox Adaptive Controllers more accessible for those with limited mobility," he says. Newsbeat's gaming reporter Steffan Powell was given exclusive access to the new device and met some of those it's designed to help.